“Mr President, I have come to report to you that South Africa is free today” – the words of Nelson Mandela on the day he cast his vote in South Africa’s first democratic elections in 1994. He was paying homage at the grave of John Dube, the founding president of the group that became today’s governing African National Congress (ANC). 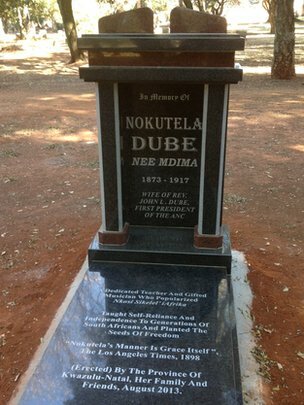 But while Dube is remembered by many South Africans today, his first wife is far from a household name. Even if he had wanted, Mandela could not have paid tribute at her grave too – it was unmarked and she had been virtually forgotten. And yet she worked hand in hand with her husband in all his major endeavours. Nokutela Dube Nokutela Mdima was born in 1873 to a family of Christian converts who were living at an American missionary station in Inanda, near Durban in the east of South Africa. After graduating from the mission’s prestigious boarding school she worked as a teacher and in 1894 married John, the son of a local Christian pastor. The couple then moved to the US, continuing their education at a missionary institute in Brooklyn, New York and John was ordained. She was “young, with blazing black eyes, smooth brown skin and handsome regular features,” says an article first published in the New York Tribune in 1898. “She speaks good English with a deliberation that is charming and in the softest voice in the world. Her manner is grace itself.” While they were in the US, the Dubes were inspired by the work of the black American educator Booker T. Washington who preached self-reliance – arguing black people had to make economic progress before they could make political progress. After returning home to Inanda the couple became the first black South Africans to start a school. The name Nokutela Dube is not well known – but a century ago she made a big contribution to South Africa’s black-empowerment movement helping to form the country we know today. Now, the director of a film about her is hoping to set the record straight and give her the recognition he feels she deserves. In 1900 they founded the Ohlange Institute which is still teaching pupils today. The Dubes created a “national spirit” bringing students from across the country together under one roof, says Prof Cherif Keita, director of the African studies programme at Carleton College in Northfield, Minnesota. “They trained generations of leaders.” Keita only found out about Nokutela while making a film about John and, feeling she had been overlooked by history, made it his personal mission to set the record straight. He has made a film about her too – Remembering Nokutela will be shown in Minnesota next month with other locally-produced films. “John’s name was always floating around, but in her case she was wiped out and yet she had been there at every stage of the building of these institutions that were ground-breaking in South Africa’s history,” he says. “Every source that you read on the founding of Ohlange says John Dube founded this school. No he didn’t. John and Nokutela Dube could not have done it without each other,” adds Prof Heather Hughes, a South African historian and biographer of John Dube, who has worked with Keita on uncovering Nokutela’s story. Nokutela started the prestigious music programme at Ohlange, composed songs and formed a choir. She also taught students cooking, house-keeping and tailoring. “The clothes that the students were capable of making competed with the clothes in the European shops in Durban,” says Keita, who argues that Nokutela’s artistic talents were key “to the whole enterprise of both awakening a political consciousness, and preparing Africans intellectually”. They set up a newspaper, produced a book of Zulu songs and popularised the song Nkosi Sikelel’ iAfrika (God Bless Africa) that became part of South Africa’s national anthem after apartheid. The Dubes returned to the US at least twice to raise funds for the school – John would speak and Nokutela would perform traditional Zulu songs and play the piano and autoharp – a hand-held wooden box with strings that are plucked. In 1912, John’s reputation as an educator helped him become the first president of the South African Native National Congress, which later became the ANC. Its purpose was to protest against racial discrimination and call for equality. Women were not allowed full membership of the organisation when it was founded but there is evidence that Nokutela was “an incredibly important female role model within that movement,” says Hughes. “A lot of historians have [thought] women weren’t involved or they were involved only in very subordinate capacities and I think that’s quite demeaning to women like Nokutela.” Despite this, all was not well in the Dube household. Nokutela was unable to have children and after 20 years of marriage John had an affair – which led to the birth of an illegitimate child. Nokutela left him and went to the Transvaal region, where for the next three years she preached the gospel to rural communities, before becoming ill with a kidney infection. When John heard about her condition he brought her to a house they owned in Johannesburg for treatment, but she died shortly after in 1917 at the age of 44. She was buried in Johannesburg but her grave had no headstone – just a reference number, CK9753 – the CK standing for “Christian Kaffir” (a racist term for a black person, widely used at the time). John moved back to Inanda to concentrate on his educational work. He remarried and had four children. (His first child, born out of wedlock had died.) While he was carrying out his research, Keita discovered a personal link to Nokutela’s story. One of the school teachers who taught the young Nokutela was a missionary from Keita’s adopted hometown of Northfields. She sent home an essay Nokutela wrote called My Home Africa which was published in a Northfields newspaper in 1882. She wrote: “We live in Africa, there are many people here. Some are good, and some are wicked. They know how to read. There are a great many who have wagons, oxen, goats, sheep and some other things. Some are rich and some are poor. Those who are poor are jealous for the things of those who are rich. “Their food are these, mealies, potatoes and other things. There are a few who are diligent, their houses look so clean and nice; and some are bad. In our homes we sleep down upon mats, and some people buy beds to sleep.” She also said that in Africa “if a person had no children, he troubled very much”. “It’s as if she had a premonition that this particular childlessness was going to be her own downfall,” says Keita. Although Nokutela took a back seat to her husband, Keita says she showed great strength of character, in particular when she left him and her home to go to an area where there was a lot of hostility between the Afrikaans-speaking white settlers and the black population. In his film he locates Nokutela’s grave and members of her family, many of whom knew little about her. One of them is Joyce Siwani, whose grandfather was one of Nokutela’s nephews. Siwani’s parents were staunch ANC activists. “As children in the 1950s we used to go to the Mandela house to collect weekly newspapers to sell. Just to know that we were following in the footsteps of somebody who had been connected with the founder was very interesting and intriguing,” she says. Siwani became a big supporter of a campaign led by Keita to properly mark Nokutela’s grave. A headstone was finally erected last year. It says: “Taught self-reliance and independence to generations of South Africans and planted the seeds of freedom.” Keita is hoping that his film makes that legacy known to a much wider audience. Cherif Keita spoke to World Update on the BBC World Service. Photos courtesy of Cherif Keita.